Thy Savior yields His breath. To shame and blows and bitter death. Blood streams from ev’ry pore. Sigh after sigh of anguish o’er. Who is it that hath bruised Thee? And caused Thee all Thy woe? Thou deeds of evil dost not know. As countless as the sands. Thy sorrows raised by wicked hands. Bound hand and foot in hell. ‘Tis I who have deserved them well. It crushed me to the ground. My healing in Thy wounds is found. That I might ransomed be. From sin and guilt hast made me free. From such a monster dire. O love, O unexampled fire! I am no longer mine. And all I have to Thee resign. My heart shall its remembrance pay. The pledge of truth and constancy. All this Thy suff’rings teach my soul. To grieve me by their wickedness. I’ll curb my vengeful heart. Forgiveness for each bitter smart. Thou shalt my Refuge be. And let me find my strength in Thee. My way to Thine eternal rest. Tr. John Kelly, 1867, alt. 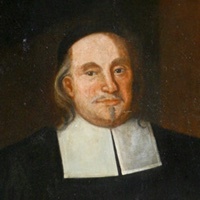 Paul Gerhardt (1607–1676), portrait at the Paul-Gerhardt-Kirche in Lübben.